Is This What Life on Mars Might Have Looked Like? A great find from the NASA archives! This composite of three artists’ renderings from 1975 may have only been wish fulfillment for an unnamed JPL artist; however, the landscape and the rendered shapes took into account what was known about Mars at that time, a year before the first Viking landing. “Life on Mars” was envisioned as low to the ground, symmetrical and simple. 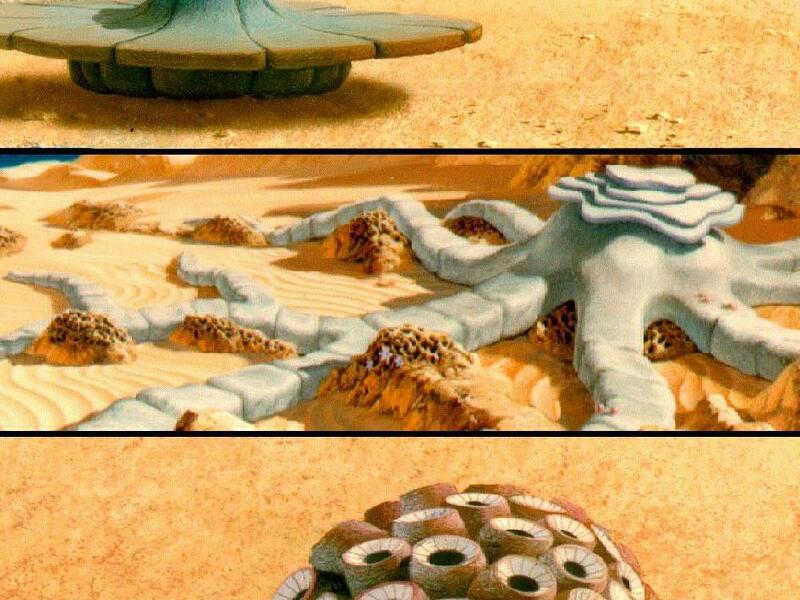 The artist drew silicon-based life forms, probably coached by others, perhaps scientists, who had thought about such possibilities. Peculiar saucer-like shapes stood only slightly above ground level, root-like structures reached outward for growth resources; a bundle of cones faced many directions for heat, light or food. Instead of reality, the images embodied the artist’s hope and anticipation of what future Martian exploration would find. Hey, at least it’s not this. And why not such forms of life or more or less similar would not be in caves or pits on Mars?? But as long as we shall not go to see a display device we can it that to speculate! Reblogged this on Lindsay Perkins Pad.